Cash coins were sometimes used as charms and clothing decorations, but people began manufacturing coin shaped charms from very early on. The charms often have interesting words and images, and learning what they meant is frequently very difficult but also rewarding. Sometimes the intent is for it to be a talisman, a lucky charm. Sometimes it is has other uses--as a teaching device, or a memnotic device. Some were used as toys for children. 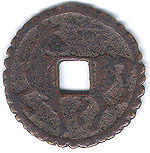 One type such coin in Japan was an early form of Hawaiian "pogs," or in Japanese "menko." Here is an interesting charm which I found recently. I call it my farm charm. It is probably Chinese and its characters mean something like "may the fragrance of the rice field increase ten-thousand fold!" This seems to reflect a wish for good crops. What I can't figure out is the meaning of the animal picture on the back. It looks to be a deer, but deer and farmers are natural enemies. Deer destroy the rice crops and farmers scare away or kill deer. Any ideas about why this charm is the way it is? One person has suggested to me that deer traditionally have been a symbol of good crops by virtue of the fact that when chased away the crops do well. 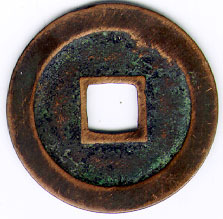 Here is another copper alloy Chinese charm which I like. I think of it as the prettiest coin I own. The legend states that the horse is a great horse from the classical past, Qu Huang, one of the 8 great horses of the Zhou dynasty king Mu Wang. The horse prancing on the reverse certainly is special. A very interesting thing about this charm which I do not understand is that the owner of the charm has filed indentations into the outside rim. Maybe it was decoration. Maybe to count. Coin collectors often like to have coins in pristine condition, coins which have not seen much use. However, this charm is one of my favorites for just the opposite reason. It has been rubbed and handled until the top broke off and the images are largely worn away. The words refer to achieving a high rank on the Chinese civil service exam. I can imagine some fervent student handling this coin all the way to success. I bought this for 50 yen in Japan after seeing it in an old pile of coins in an antique shop, and when I showed it to my friends at lunch they each inspected it and, without thinking, began rubbing it. Here is a Japanese charm. it is called a hidari koma, which means "pony going left." It has no words but is a humorous view of a man and his packhorse. Somehow the man seems to be losing. There is the possibility that what I describe as a man is a monkey. 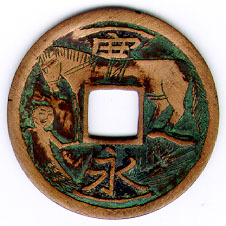 Monkey and horse coins are also quite common. 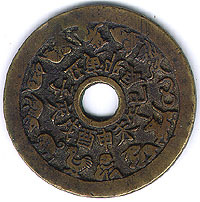 A complicated system of beliefs about the various animals' relations to the five elements of earth, fire, wood, water and metal, makes such coins protection for a horse's health. 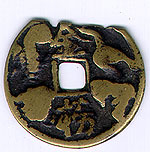 Here is another hidari koma but it was made by directly carving the image into a Kan'ei tsuuhou coin. 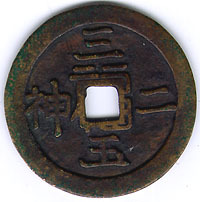 The original coin is probably a type from around 1714 called a "shukuji haibun muhai" which means that it is a later version of the 1660's "bunsen" which had no bun character on the back, but I am not sure. This was found in Java, and the carving of the coininto a charm is likely to have been done in Java (I have seen another Kan'ei tsuuhou similarly carved with two Javanese dancer images.). It was improperly cleaned with an abrasive, which makes it look very new but the corrosion in the bridle and the lines of the rear right legetc. suggests that the carving is not that recent. Here is another Japanese charm. It has two foxes, which represent the god Inari, standing before a plate of "tama" jewels. The tama refers to both the spirit of Inari itself, and also to the worldy benefits, such as wealth, which Inari has to offer. 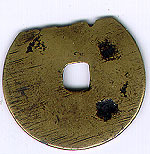 The symbol on the bottom is a traditional warehouse key, in this case the key to unlock the treasurehouse of Inari. 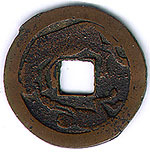 Perhaps some Inari believers carried this coin in their purse hoping for wealth to accumulate. Here is another Japanese fox charm. The words between them on the front say "Fushimi" in reference to the largest Inari shrine, one south of Kyoto. On the back its says "raising the kingpost" which referes to beginning construction on a building. 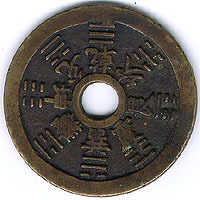 Around the outer rim on the reverse it say's, "Happiness in all the more than 60 provinces of Japan." This may have been a gift of the shrine to people who contributed money to rebuilding a shrine building, but I am not sure. 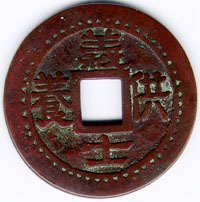 "Charm" is a catchall term for coin shaped items which were not official (or counterfeit) money. However we should not believe that they were necessarily considered magical or lucky. This one was probably a memnotic coin. It has the 8 cardinal directions and associated I-ching symbols on one side, and on the other the 12 animal zodiac in both picture and character. This charm probably comes from Ming era China. The characters refer to something, probably wealth, increasing ten thousandfold each day. The reverse side picture is very complex. It pictures a scale. 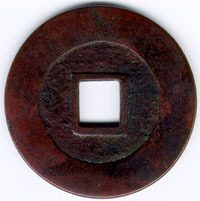 On the left side is the character for "intention" or "mind" in a circle. On the right side is an image which traditionally means heart. Perhaps the meaning is that for wealth to increase mind and heart must be in balance. The mind is helped by the empty square hole in the center which seems attached to the scale. What does it refer to? Below it the fingernail shaped object represents the moon. 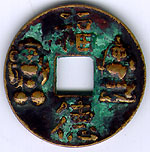 Its positioning is perhaps to balance the "sun" character on the top front. 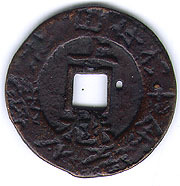 Perhaps this coin was used by a monk while teaching a parishoner. 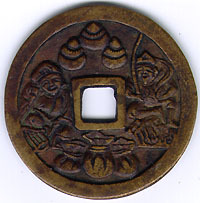 This is a larger Japanese charm representing the popular gods Ebisu and Daikoku. Ebisu is a god of fisherpeople and commerce, and Daikoku is a god of commerce. Ebisu holds a fishing pole with a freshly caught sea bream, and Daikoku always is sitting on large bales of rice. In this picture they have three bags of money sitting in front of them as well. The three beehive shaped things at the top are the "tama" (as in the Inari charm above) representing the spirit of the gods as well as wealth. 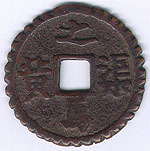 On the back side is written top to bottom "three tama" and right to left "two gods." Around the center hole is what looks like a squiggly design. 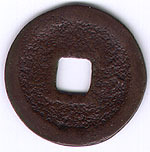 It is actually the character for "fuku" meaning "wealth and good fortune" but with the center missing where the hole is. This may involve a punlike reference to the popular incantation "fuku wa uchi" or "wealth is inside (the home)." This piece was probably made in the last half century. 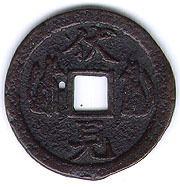 Here is another Ebisu and Daikoku charm from Japan. This one is small, about the size of a one mon coin. it is very interesting because the Ebisu and the Daikoku are in high relief. Their bellies which stick out a full millimeter from the coin have been worn severely through long usage. The front has Daikoku on the left, holding his hammer which brings wealth in his right hand and standing on two bales of rice. Ebisu is on the right with a fishing pole. Thr front words say "fukutoku" which means wealth and righteousness but the righteousness (toku) is also a pun for" profit" which is probably more to the point with these gods. 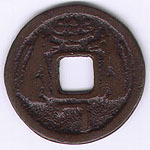 the reverse has written "kotobuki" which means 'felicitations". This coin seems to be of very high quality manufacture, but I cannot decide whether it is cast or some other form of metalwork. It may be carved. 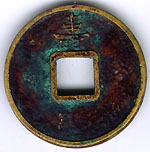 The green is copper rust.The brown (most visible on the reverse) seems to be a coating, perhaps lacquer, put on the recessed parts of the coin to make the relief images stand out more. Ebisu and Daikoku small coin. This is a charm with the words written Gishi Kuyou which means something like "Offerings to the Spirits of the Righteous Warriors." A Japanese friend tells me that this is probably a Meiji era souvenir of Minatogawa Shrine, which is near Kobe. The term Gishi, or "righteous warriors" refers mainly to warriors who fought in the imperial cause, such as Kusunoki Masashige,who fought and lost a famous battle at Minatogawa in 1336, or the Ako samurai--the famous 47 ronin--who in 1701 avenged their lord's death by killing the man who had insulted him and nevertheless escaped punishment.This latter crew came to be reenvisioned in late Edo and in Meiji as imperial loyalists as well. Mizoguchi has a great1942 film about the Ako samurai which nevertheless has the silliest episodes emphasising the imperial loyalty of the 47 samurai. This was of course because of intensification of modern--by which I mean post 1868--imperial loyalism being used as one of the ideological foundations of the war effort. 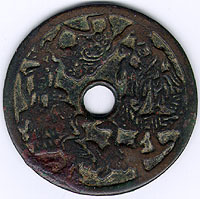 Another knowledgeable friend tells me that this coin looks to be more modern than Meiji,. perhaps even post WWII. 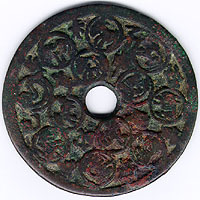 Anyhow, although I am not fond of the calligraphy, this coin is a lovely object because of its rich texture and color, and interesting for the row of triangular dots around the rim. This design that of a well known Song Dynasty charm (Schloth no. 74), but many later versions exist. This peice her is worn and I have no idea of the age. On the front are pictured the two sage kings Yao and Shun seated on the left and right of the center hole. Below are the turtle and crane of longevity, and above is the North Star Constellation and something else like a cloud which I cannot recognize. On the back are the twelve zodiac animals and the Chinese characters referring to them.